Dr. James E. Hansen, former director of the NASA Goddard Institute for Space Studies and adjunct professor at Columbia University’s Earth Institute, will address television meteorologists, media and the public as the keynote speaker at Operation Sierra Storm, Thursday, Jan. 8, 2015, 9 a.m. at Harveys Lake Tahoe. The Lake Tahoe Visitors Authority sponsors and partners are inviting the community, visitors and media to attend free of charge. Info: http://www.osstahoe.com. Dr. Hansen’s presentation will include his take on assuring real progress on climate — whether and how an international climate accord can achieve intergenerational and global justice. If you are planning to attending I wanted to give you some background on how well Dr Hansen’s modeling projects are holding up to reality. The HadCRUT folks at the UK Met Office at the Hadley Centre provided the August 2014 global temperature dataset. 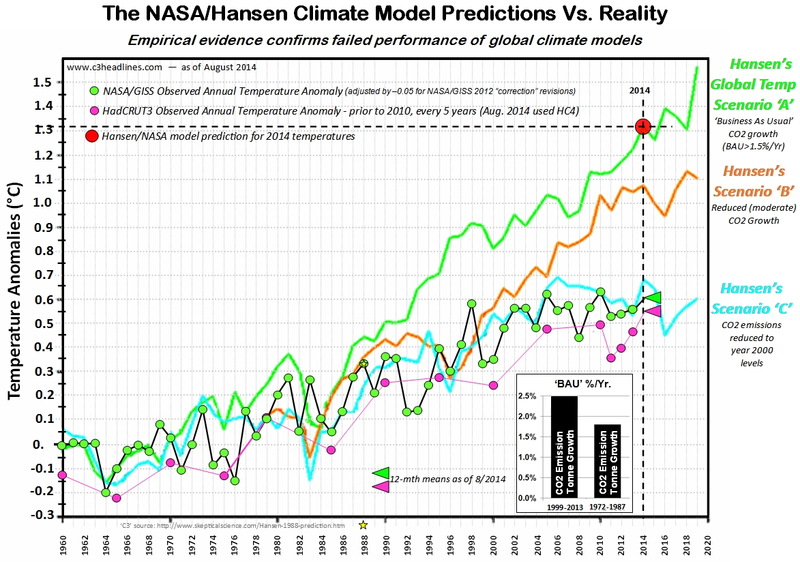 C3 Headlines updated the graph above showing the (in)famous NASA climate model versus the reality. On the chart, the green curve is NASA’s depicted BAU scenario for global temperatures. This was referred to as ‘Scenario A’ for global temperatures and was associated with a CO2 emission metric tonne growth that exceeded 1.5% per year. On the record, over the last 15 calendar years CO2 emission tonne growth has clocked in at about 2.5% per year – well over the ‘BAU’ bar that Hansen and NASA had proclaimed as an end-of-the-world disaster as we know it. Back in the summer of 1988, James Hansen presented his climate model computer simulations to a Congressional Committee, which predicted that global warming would be excessive and dangerous if CO2 emissions continued in a similar ‘business-as-usual’ (BAU) manner. The Committee Staff turned off the AC and opened the meeting room windows to a hot muggy DC summer day, to insure the panel members were sweeting during the presentation. If you wanted to ask an intelligent question of Dr. Hansen, ask him to explain now that the NASA’s Orbiting Carbon Observatory-2 shows more CO coming from the open ocean and rain forests in South America and Africa, than from industrial nations, how does this latest data impact his projection, if it is nature and not man producing most of the CO2. 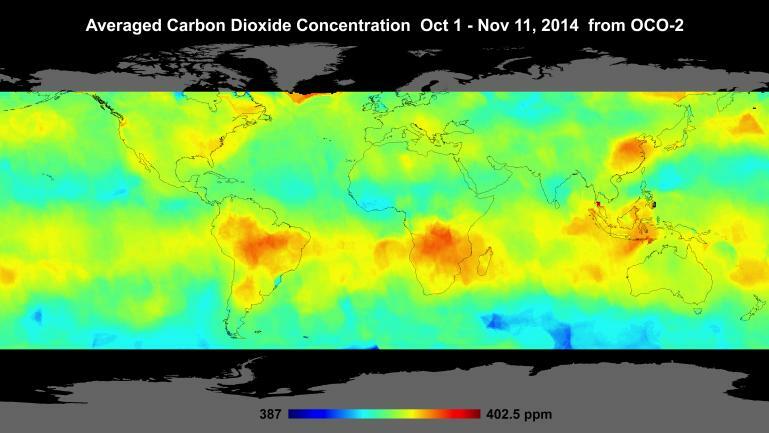 Global atmospheric carbon dioxide concentrations from Oct. 1 through Nov. 11, as recorded by NASA’s Orbiting Carbon Observatory-2. Carbon dioxide concentrations are highest above northern Australia, southern Africa and eastern Brazil. Preliminary analysis of the African data shows the high levels there are largely driven by the burning of savannas and forests. Elevated carbon dioxide can also be seen above industrialized Northern Hemisphere regions in China, Europe and North America. This entry was posted in Analysis, Climate, Local. Bookmark the permalink. I recently had a discussion about God and faith with George. Global warming is simply a religion based on faith. Evidence that contradicts one’s faith is irrelevant and is summarily discarded by the true believer. Our only hope is that folks like you and Watts stop people before they are true believers. Thanks Russ! Thanks for the kind words. We are just trying to get people to look at the facts and make rational decisions.